The few of you who follow my turntable reviews will be aware that I was mightily impressed with the Opera Audio LP5.0 record deck. Here was a high-end turntable from China with a build quality and sound worthy of some of the best of the West. 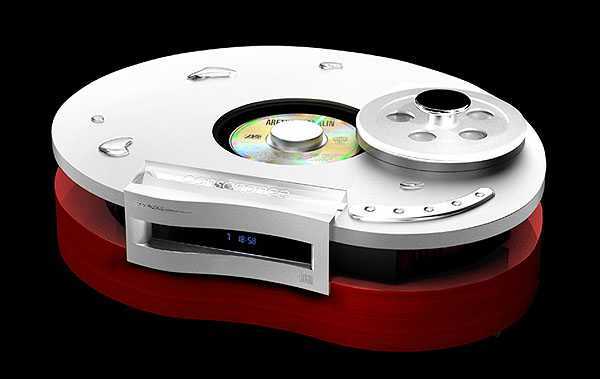 So it came as no surprised that Opera wanted me to try their matching CD player, the CDP 5.0. One of the outstanding aspects of the LP 5.0 record spinner was its simply beautiful wooden plinth and general fit and finish. The CDP 5.0 seems to use the same, or very similar plinth, but this time reversed so the widest section faces the room rather than forming the back. This means that side-by-side they match to a certain extent but remain distinctive. The top plate is fashioned from a 20mm thick slab of machined aluminium and sitting in the centre is the biscuit-tin lid for the transport. 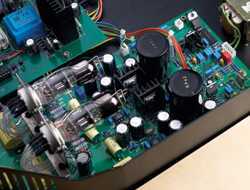 The whole effect is dramatic in the extreme, matching some very expensive CD players - as before fit and finish being excellent. On a turntable this sort of extrovert styling seems to work really well, here I have mixed feelings, somehow it's almost over-the-top and some visitors agree, others love it. Personally I can live with it and it certainly turns heads. OK so it's a pretty box, it's also pretty substantial - I didn't weigh it, the Opera site claims it's 30 kgs and I struggled to lift it into place on the shelf. 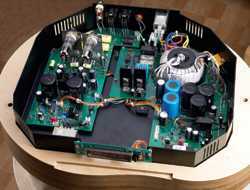 This weight is partially explained by the casing but there're some hefty transformers on board as well as a lot of full-sized, and quality components. No surface mount here it seems. Technically it's an advanced player featuring a top-loading, floating Sony transport, a "de rigeur" sigma delta 24/192 converter, a special "super-clock", RCA and balanced outputs and finally a digital RCA out. However the main interest for some is the use of a valve based (6H30) output stage - this in early incarnations of the player having a variable output - now fixed. Valve output stages for high-end players are getting quite a following, but as they are well hidden here it's a case of the designer using them for sonics rather than decoration. The only notable omission being HDCD capacity, but how relevant this is, is open to question with a limited catalogue and uncertain future. And on that topic, those wondering why someone should spend this kind of money on an obsolete technology should wander down to their local music shop and count the SACD's and DVD-A's on the shelf and ask themselves whether they'd rather spend the money on doomed formulae (IMHO) which are compromised when playing your CD collection. I was delighted to see five buttons on the top of the unit, "on/off", "play", "pause", "stop", and "next and previous". I can't honestly see what else anyone needs. And it's just as well because the beautifully machined alloy remote has 20-odd identical pinhead-sized buttons with almost invisible markings. It's also black, slim and slippery and just made for diving inside furniture. My thoughts on remotes generally are well known but this, despite the build quality, is a very poor example. So the beast was set up on a decent turntable support from Clearlight Audio, not as good as the dedicated stand, but as the latter wasn't supplied and I'd no room for it anyway I did the best I could. Integrated players are nice as there's no messing about with interconnects beyond plugging it into the M3 preamp. Switch-on was accompanied by a faint click and then the whole thing lit up ready to play. Pulling off the heavy nylon and alloy CD cover reveals the transport "pit" where you drop the CD and then cover the label with a magnetic puck. Replacing the lid starts the TOC reading and then you just hit "play". I'm not a CD fan. Generally all but the very best of the breed sound small, flat, uninteresting and with a hard midrange. The best reduce these faults and bring the silent background and lack of the obvious distortions of vinyl to the party. But the Opera made me smile - why? Because here was a big, generous, bouncy player. 'Scale' seems to escape CD players, even ones as exulted as the Mephisto, but the Opera really did sound like a turntable at times - and a good one at that. Lets take an example. Eric Bibb's "Loving in My Babies Eyes". This has a lovely big acoustic, a big, fat bass line and Eric's sumptuous baritone. He's there before you, you can feel his facial expressions as he sings. At the other end of the scale the tinkly guitar and zither (?) are light and airy, but not over tinkly and rattly as that CD midrange can often produce. But the overall impression is always one of unforced, effortless scale - something that you can listen to all evening but still moves rather than soperates (or is that a made up word?:-). As I hurtle toward late middle age I'm currently indulging in some nostalgia and listening to Black Sabbath's "Paranoid". I make no excuses beyond this, but the fact that I find myself playing this on a CD player when I also have it on vinyl is significant. This sort of stuff is often at it's worse on CD, ending up so harsh and compressed that you get a headache, at the same time the driving force of the music is lost. Not with the CDP 5.0 - I can sit and luxuriate in the simple and sleepy bass of "Planet Caravan" and then be woken up by the Dalek voice of "Electric Funeral". So it's all praise to the big Opera, though it's sister LP player still has an edge for me, but then I have to stop leaping about to turn the record over so it's no contest really. The rather more subtle charms of Norah Jones are just made for relaxed evenings, the Opera made you want to light the fire and pull up the armchair and just drift off into "The Long Day is Over"... But for all it's comfort the brushed snare, the double bass were all there - with the body that makes real instruments rather than electronic substitutes. Putting it up against a well established (and considerably more expensive) high-end player like the Mephisto is interesting. The latter is refined and detailed to a level beyond that of the Opera. Especially listening to Audiophile CD's the Mephisto is - well more audiophile really... Drumkits recorded in drum-booths and mixed back in the soundstage get more air around them than with the Opera. The payoff is that the Opera is bigger and more meaty in it's presentation - you get less shimmer and more crash from the cymbals and, for example, Mark Knoplers voice is (artificially - in the studio) warmed where it can sound a little reedy on the Mephisto in comparison. Once again I'm putting up the Opera against fine opposition and it comes out as being extremely capable and able to hold it's own albeit in its own way. Over a wide range of music the Opera made a strong case for itself. In some respects already mentioned, it came close to a turntable, and I would say that for a system optimised to a quality turntable the Opera would just slot straight in, often such a usurper needs a change in balance to restore harmony. Though it trails some players, for instance the Mephisto, in the ability to drag every last ounce of detail, harmonic structure and ambience from every disc, it does all these things well enough to leave cheaper players behind, and counters with the rare ability to make real sized instruments and players inhabit your listening room. If your taste in music is small chamber orchestra, light jazz and folk with a lot ambience then the Opera will be excellent, but there are other players that will pull the detail in such recordings more to the fore. If on the other hand your taste is more eclectic and takes in Heavy-Metal, full orchestral work-outs, driving electric blues and sultry voices then the Opera should be on anyone's shortlist. I didn't try the CDP as a transport, but if it stays for a little longer I no doubt will, I suspect that with its sheer mass and high quality transport section it'll do well. But as its DAC and in particular the output section, are one of the main reasons for buying the thing in the first place, it seems a rather odd thing to attempt anyway. In fact I rather wish there was a digital "in" so that it could act as a DAC for other sources but I guess that's hardly commonplace. I like the CDP 5.0 a lot. From a sheer value-for-money point of view it's a winner - you can't buy better made, more dramatically styled or get more kgs for your money elsewhere. As Opera are a well-established company, well served by international distributors, you don't have the "cheap-but-risky" scenario either. Looked at from a money-no-object angle it does nothing badly, doesn't refine the guts out of music (which is the trap many CD players with high-end pretensions fall into), and manages to extract the fun and music from anything dropped into it's transport. It sounds just like it looks, big-hearted and powerful. I was wracking my brains to think what it reminds me of, and in the end the closest thing I could come to it was the Linn LP12. Like that player, here you have something that can be criticised for falling short of the best in the more esoteric aspects of musical reproduction, but cuts to what could be called the "heart" of the music, not least being its excellent timing. Often that's a euphemism/excuse for low-fi, but here, as with the Linn, it produces a presentation that in certain fundamental ways is a perfectly valid approximation of the live event and more importantly, is one that this writer at least is happy to sit in front of.